I opened the first Vegetarian Restaurant in Cape Town, South Africa, and subsequently became co-owner of a major Health Food Store. I have made a lifelong study of Vegetarianism, allergies, and detoxification. The public is not informed as to the extreme health risks involved in eating fish or meat. Debates about organic versus non-organic eggs, or playful articles regarding the latest update on butter versus margarine, distract the public into believing that they are well informed. Arachidonic acid in animal foods, is linked to brain inflammation, and depression. Just one meal of high-fat animal products, has been shown to greatly increase inflammation, within hours. Wild meat also causes inflammation, and the higher the fat content, the more the inflammation distributes in the lungs. Meat eating increases your risk of cataracts, inflammatory bowel disease, and chronic pulmonary obstructive disease (COPD), premature wrinkles, and kidney failure. Animal fat has been linked to pancreatic cancer. Chicken has been linked to urinary tract infections. Nitrites in processed meat form carcinogens, and are associated with brain tumors, and childhood leukemia. Highest sources are hot dogs, pepperoni, and processed deli and cured meats. High levels of PCB (industrial toxin) is found in fish, and eggs (94% of eggs tested). The top foods that cause advanced glycation end products (AGEs) are all meat sourced, with roasted BBQ chicken skin and fried bacon being the top. The effect of AGEs range from premature aging, to inflammation, to stiffness, in all body parts. Meat that is contaminated with salmonella) can now legally be sold. Pork tapeworm brain infection is the most common parasite disease in the brain, and has increased for people living in the United States. 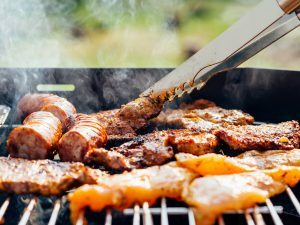 Nearly 50 % of U.S. meat tested is contaminated with the bacteria Staphylococcus, the highest being found in turkey, chicken, and pork. Fish eaters have been shown to have only a fraction of the sperm count of vegans, and this could be caused by the fact that Xenoestrogens, which are chemicals with feminizing, estrogenic effects, have been found in fish, as a fish is really like a sponge, that simply soaks up every toxin in the ocean. Pregnant women, eating fish only once a week, transfer to their fetus, more mercury than if they were injected with six mercury-based vaccinations. Worst offender is tuna. A study found that almost 70% of chicken breasts contained a carcinogenic form of arsenic, way beyond the safety limits set by the FDA.